1937 Frigidaire Refrigerator original vintage advertisement. 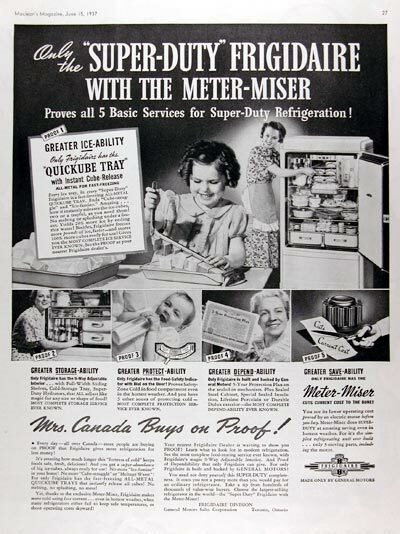 Ony the Super Duty Frigidaire with the Meter Miser proves all 5 basic services for Super Duty Refrigeration! Greater Ice-Ability, Greater Storage-Ability, Greater Protect-Ability, Greater Depend-Ability, and Greater Save-Ability. Meter Miser cuts current cost to the bone!